Acute otitis externa. Ear canal is red and edematous, and discharge is present. 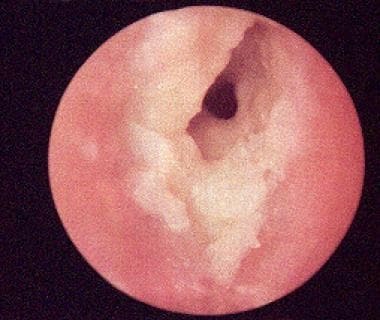 The patient’s history and physical examination, including otoscopy, usually provide sufficient information for the clinician to make the diagnosis of OE. Note that a patient who is diabetic or immunocompromised with severe pain in the ear should have necrotizing OE excluded by an otolaryngologist. Imaging studies are not required for most cases of OE. However, radiologic investigation may be helpful if an invasive infection such as necrotizing (malignant) OE is suspected or if the diagnosis of mastoiditis is being considered. Otitis externa (OE) is an inflammation or infection of the external auditory canal (EAC), the auricle, or both. [1, 2, 3] It is a common disease that can be found in all age groups. OE usually represents an acute bacterial infection of the skin of the ear canal (most commonly attributable to Pseudomonas aeruginosa or Staphylococcus aureus  ) but can also be caused by other bacteria, viruses, or a fungal infection (see Pathophysiology and Etiology). Although OE rarely causes prolonged problems or serious complications, the infection is responsible for significant pain and acute morbidity (see Presentation). Prompt diagnosis (see DDx and Workup) and appropriate therapy (see Treatment) cure the majority of cases without complications; however, patients who are diabetic, immunocompromised, or untreated may develop necrotizing (malignant) OE, a potentially life-threatening infection. The external ear (see the image below) consists of the auricle and the EAC. The auricle is composed of elastic cartilage with the overlying skin attached directly to the perichondrium. It begins to form during week 6 of gestation through consolidation of portions of the mesoderm of the first and second branchial arches, giving rise to the His hillocks. The first three hillocks are derived from the first arch, the second three from the second arch. The auricle reaches adult shape by the week 20 of gestation, but the adult size is not reached until the age of 9 years. The EAC begins to form during week 8 of gestation, when the surface ectoderm of the first pharyngeal groove thickens and grows toward the middle ear. This core of tissue begins to resorb by week 21 of gestation to form a channel that is complete by week 28. The canal reaches adult size by the age of 9 years and ossifies completely by the age of 3 years. The EAC is related to the mandibular fossa anteriorly, the mastoid air cells posteriorly, the middle cranial fossa superiorly, and the parotid gland inferiorly. The EAC is lined with squamous epithelium and is approximately 2.5 cm long in adults. Its function is to transmit sound to the middle ear while protecting more proximal structures from foreign bodies and any changes in environmental conditions. The outer one third of the canal is primarily cartilaginous and is oriented superiorly and posteriorly; the inner two thirds of the canal is osseous, is covered with thinner skin that adheres tightly, and is oriented inferiorly and anteriorly; this portion of the canal is devoid of any apocrine glands or hair follicles. The thicker skin over the outer (cartilaginous) portion of the EAC contains apopilosebaceous units comprising apocrine and eccrine glands that secrete their products around the base of a hair follicle. These secretions combine with sloughed squamous epithelium (cerumen) to coat the EAC and maintain an acidic pH (4-5). This cerumen coat migrates from the isthmus of the EAC to the lateral part, and its waxy nature protects the underlying epithelium from maceration or skin breakdown. The quantity of cerumen produced varies widely among individuals. The acidity of the cerumen inhibits bacterial or fungal growth. Whereas a paucity of cerumen allows bacterial growth, an excess can create an environment ideal for bacterial invasion by allowing retention of water and debris (as when the EAC is regularly exposed to water). Localized trauma from foreign objects placed in the ear can also lead to direct bacterial invasion in the ear canal. Once an infection becomes established, localized maceration and inflammation occur, which lead to symptoms. If moisture is trapped in the EAC, it may cause maceration of the skin and provide a good breeding ground for bacteria. This may occur after swimming (especially in contaminated water) or bathing—hence the common lay term “swimmer’s ear.” It may also occur in hot humid weather. Obstruction of the EAC by excessive cerumen, debris, surfer’s exostosis, or a narrow and tortuous canal may also lead to infection by means of moisture retention. Trauma to the EAC allows invasion of bacteria into the damaged skin. This often occurs after attempts at cleaning the ear with a cotton swab, paper clip, or any other utensil that can fit into the ear. Once infection is established, an inflammatory response occurs with skin edema. Exudate and pus often appear in the EAC as well. If severe, the infection may spread and cause a cellulitis of the face or neck. Necrotizing (malignant) OE is a rare complication that occurs in patients who are immunocompromised or in those who have received radiotherapy to the skull base. In this condition, bacteria invade the deeper underlying structures of the soft tissues and cause osteomyelitis of the temporal bone. This is a life-threatening disorder with an overall mortality that historically has approached 50%. OE is most often caused by a bacterial pathogen; other varieties include fungal OE (otomycosis) and eczematoid (psoriatic) OE. In one study, 91% of cases of OE were caused by bacteria. Others have found that as many as 40% of cases of OE have no primary identifiable microorganism as a causative agent. The most common causative bacteria are Pseudomonas species (38% of all cases),  Staphylococcus species, and anaerobes and gram-negative organisms. Fungal OE may result from overtreatment with topical antibiotics or may arise de novo from moisture trapped in the EAC. It is caused by Aspergillus 80-90% of the time; Candida and other organisms have also been isolated. This condition is characterized by long, white, filamentous hyphae growing from the skin surface. Besides otorrhea, erythema and edema of the EAC are common. In severe cases, soft tissue stenosis may be present. Extension of the infection may manifest as cellulitic skin changes involving the concha of the auricle and the tragus. Chronic OE is a fairly common condition that is sometimes the result of incomplete treatment of acute OE. More often, however, chronic OE is caused by overmanipulation of the ear canal as a consequence of cleaning and scratching. Such overmanipulation results in a low-grade inflammatory response that causes further itching of the skin. Eventually, the skin thickens, and canal stenosis may occur. Necrotizing OE occurs in patients who are immunocompromised and represents a true osteomyelitis of the temporal bone. OE is found in all regions of the United States, occurring in 4 of every 1000 people annually. [8, 10] The infection is believed to be more prevalent in hot and humid conditions such as prevail during the summer months, presumably because participation in aquatic activities is higher. [4, 8, 14] Acute, chronic, and eczematous OE are also common. Necrotizing OE is rare. Although the infection can affect all age groups, OE appears to be most prevalent in the older pediatric and young adult population, with a peak incidence in children aged 7-12 years. A single epidemiologic study from the United Kingdom found a similar 12-month prevalence for individuals aged 5-64 years and a slight increase in prevalence for those older than 65 years. This was postulated to occur secondary to an increase in comorbidities, as well as an increase in the use of hearing aids, which may cause trauma to the EAC. OE affects both sexes equally. No racial predilection has been established, though people in some racial groups have small ear canals, which may predispose them to obstruction and infection. Most incidents of OE resolve without difficulty. The majority of patients improve within 48-72 hours of antibiotic administration. Failure to improve within 2-3 days should call the diagnosis into question and prompt the physician to reevaluate the patient. OE usually resolves fully in 7-10 days. Resolution of eczematoid OE occurs with control of the primary skin condition. In some patients with OE, the ear must be debrided for full resolution. Surgical incision and drainage are sometimes necessary. In some patients, OE can cause severe otalgia necessitating administration of narcotic pain relievers. Pain usually improves 2-5 days after initiating therapy. Temporary hearing loss is common secondary to canal occlusion. Severe infections may cause lymphadenitis or cellulitis of the face or neck. If left untreated, the infection may invade the deeper adjacent structures and progress to necrotizing (malignant) OE, a serious condition that requires prolonged treatment and often results in severe morbidity or mortality. This complication is almost exclusively seen in immunocompromised patients, such as those with diabetes, AIDS patients, those undergoing chemotherapy, and patients taking immunosuppressant medications (eg, glucocorticoids). Pseudomonas is the inciting organism in the vast majority of cases. When necrotizing OE develops, mortality is in the 20% range among adults, mostly because of the associated comorbidities and the rapid extension of the infection to include sepsis or intracranial extension. If left untreated, necrotizing OE has a mortality approaching 50%. This complication should be suspected if the patient’s pain and tenderness seem out of proportion to clinical appearance or if granulation tissue is seen in the ear canal. OE is a common problem, with risk factors that are easily avoided. Education regarding ways of keeping the ear dry is helpful. Preventive use of acidifying drops is encouraged in patients with recurrent OE. Avoidance of the use of cotton-tipped swabs to remove ear cerumen should be discussed with patients. Improper use of cotton-tipped applicator sticks simply packs cerumen into the canal and can cause trauma to the tympanic membrane. Patients should be made aware that when OE does strike, it can usually be resolved in a short time, with few if any complications. For patient education resources, see the Ear, Nose, and Throat Center, as well as Swimmer’s Ear. Bojrab DI, Bruderly T, Abdulrazzak Y. Otitis externa. Otolaryngol Clin North Am. 1996 Oct. 29(5):761-82. [Medline]. Cantor RM. Otitis externa and otitis media. A new look at old problems. Emerg Med Clin North Am. 1995 May. 13(2):445-55. [Medline]. [Guideline] Rosenfeld RM, Schwartz SR, Cannon CR, Roland PS, Simon GR, Kumar KA, et al. Clinical practice guideline: acute otitis externa. Otolaryngol Head Neck Surg. 2014 Feb. 150 (1 Suppl):S1-S24. [Medline]. Rowlands S, Devalia H, Smith C, Hubbard R, Dean A. Otitis externa in UK general practice: a survey using the UK General Practice Research Database. Br J Gen Pract. 2001 Jul. 51(468):533-8. [Medline]. [Full Text]. Grandis JR, Curtin HD, Yu VL. Necrotizing (malignant) external otitis: prospective comparison of CT and MR imaging in diagnosis and follow-up. Radiology. 1995 Aug. 196(2):499-504. [Medline]. [Full Text]. Hegde AN, Mohan S, Pandya A, Shah GV. Imaging in infections of the head and neck. Neuroimaging Clin N Am. 2012 Nov. 22(4):727-54. [Medline]. Clark WB, Brook I, Bianki D, Thompson DH. Microbiology of otitis externa. Otolaryngol Head Neck Surg. 1997 Jan. 116(1):23-5. [Medline]. Holten KB, Gick J. Management of the patient with otitis externa. J Fam Pract. 2001 Apr. 50(4):353-60. [Medline]. Hughes E, Lee JH. Otitis externa. Pediatr Rev. 2001 Jun. 22(6):191-7. [Medline]. Osguthorpe JD, Nielsen DR. Otitis externa: Review and clinical update. Am Fam Physician. 2006 Nov 1. 74(9):1510-6. [Medline]. Russell JD, Donnelly M, McShane DP, Alun-Jones T, Walsh M. What causes acute otitis externa?. J Laryngol Otol. 1993 Oct. 107(10):898-901. [Medline]. Roland PS, Stroman DW. Microbiology of acute otitis externa. Laryngoscope. 2002 Jul. 112(7 Pt 1):1166-77. [Medline]. Roland PS. Chronic external otitis. Ear Nose Throat J. 2001 Jun. 80(6 Suppl):12-6. [Medline]. Centers for Disease Control and Prevention. Estimated burden of acute otitis externa--United States, 2003-2007. MMWR Morb Mortal Wkly Rep. 2011 May 20. 60(19):605-9. [Medline]. Alva B, Prasad KC, Prasad SC, Pallavi S. Temporal bone osteomyelitis and temporoparietal abscess secondary to malignant otitis externa. J Laryngol Otol. 2009 Nov. 123(11):1288-91. [Medline]. Kim D, Bhimani M. Ramsay Hunt syndrome presenting as simple otitis externa. CJEM. 2008 May. 10(3):247-50. [Medline]. Zhang T, Dai C, Wang Z. The misdiagnosis of external auditory canal carcinoma. Eur Arch Otorhinolaryngol. 2013 May. 270 (5):1607-13. [Medline]. Collier SA, Hlavsa MC, Piercefield EW, Beach MJ. Antimicrobial and analgesic prescribing patterns for acute otitis externa, 2004-2010. Otolaryngol Head Neck Surg. 2013 Jan. 148 (1):128-34. [Medline]. Roland PS, Belcher BP, Bettis R, Makabale RL, et al. A single topical agent is clinically equivalent to the combination of topical and oral antibiotic treatment for otitis externa. Am J Otolaryngol. 2008 Jul-Aug. 29(4):255-61. [Medline]. Mosges R, Nematian-Samani M, Hellmich M, Shah-Hosseini K. A meta-analysis of the efficacy of quinolone containing otics in comparison to antibiotic-steroid combination drugs in the local treatment of otitis externa. Curr Med Res Opin. 2011 Oct. 27(10):2053-60. [Medline]. Brooks M. FDA clears finafloxacin ear drops (Xtoro) for swimmer's ear. Medscape Medical News. Available at http://www.medscape.com/viewarticle/836771. December 17, 2014; Accessed: March 19, 2018. Caffier PP, Harth W, Mayelzadeh B, Haupt H, Sedlmaier B. Tacrolimus: a new option in therapy-resistant chronic external otitis. Laryngoscope. 2007 Jun. 117(6):1046-52. [Medline]. Otitis externa with ear wick in place. Note discharge from canal and swelling of canal. Anatomy of external and middle ear.